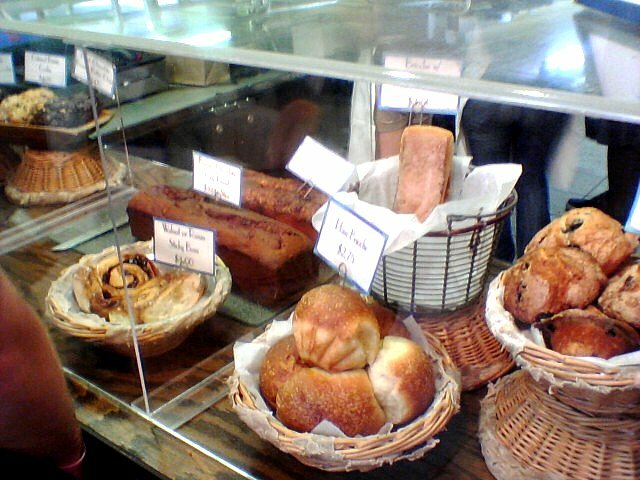 Levain Bakery was one of my stops to make while in the city. I've been there before, but the pictures never got uploaded. 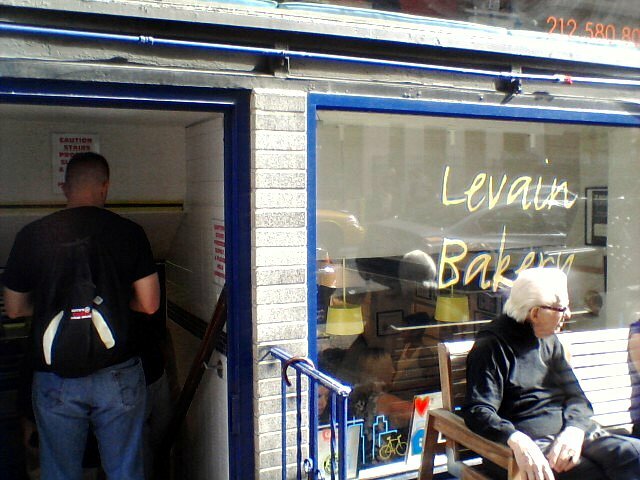 It's a small bakery with very minimal seating. Upon entering, you walk down to see a view of the kitchen, with trays of freshly baked treats and bakery goods that have yet to be put in the oven. 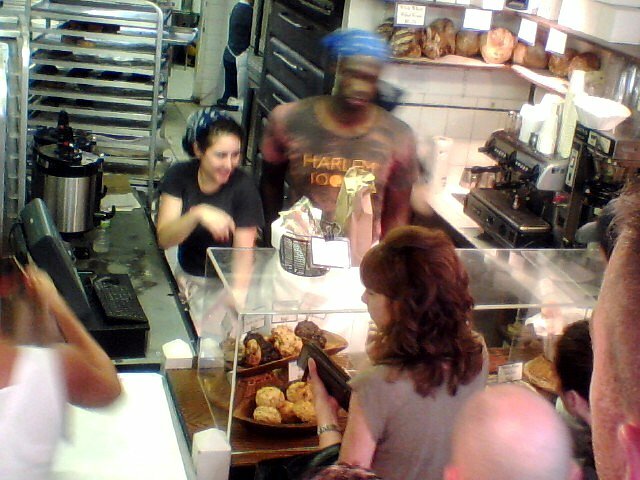 The bakery is always busy, and yesterday (Sunday) was no exception. Between the three men in front of me, the total amount of cookies purchased was near 30! Along with an assortment of sweet and savory baked goods, there's also a decent beverage menu. Their coffee is only $1.25 (cheap for the area) and the water isn't too bad (I think it was less than $2, similar to buying it from a street vendor). Besides the basics, they also offer traditional espresso drinks, hot chocolate, and tea. Back to the cookies that have made Levain so popular amongst the blogging world. I managed to take a few decent pictures through the wall of people. 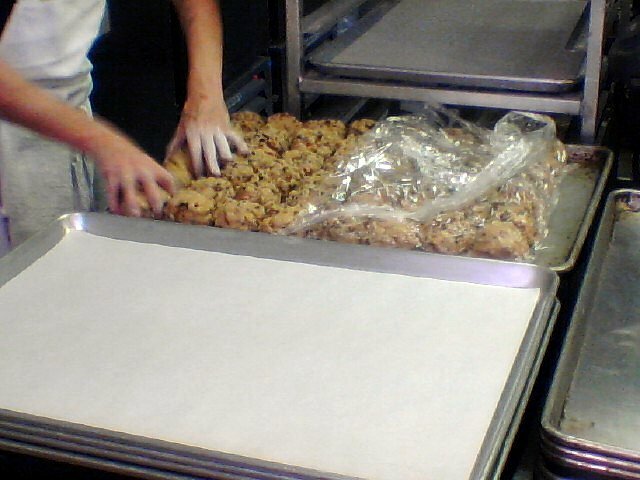 This is a tray of refrigerated chocolate chip walnut cookies being put on a baking sheet. They're bigger than baseballs! Here's the display case. If you're not in the mood for a cookie, they sell savory pizzas, baguettes, scones, brioche rolls, cinnamon rolls, and quick breads. If you do want a cookie, you can choose between a few different flavors, like the aforementioned chocolate chip walnut, or chocolate peanut butter, or oatmeal raisin. The cookies will run you $4 a pop, but they're so large that you can split one between friends, or save half for later. 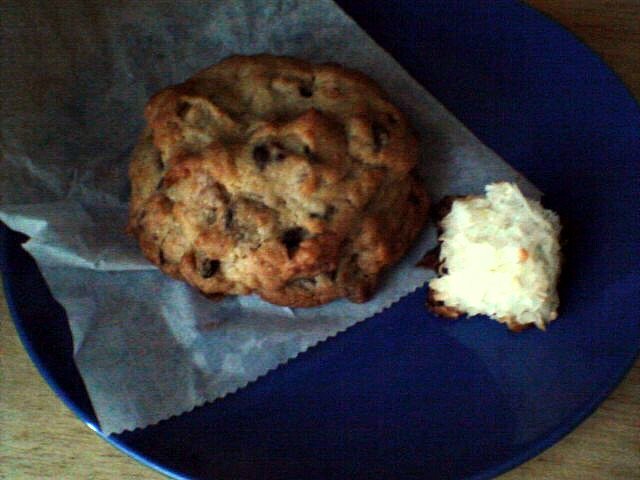 Here is my cookie next to a macaroon, for scale. As you can tell, it's quite large and about two inches tall. 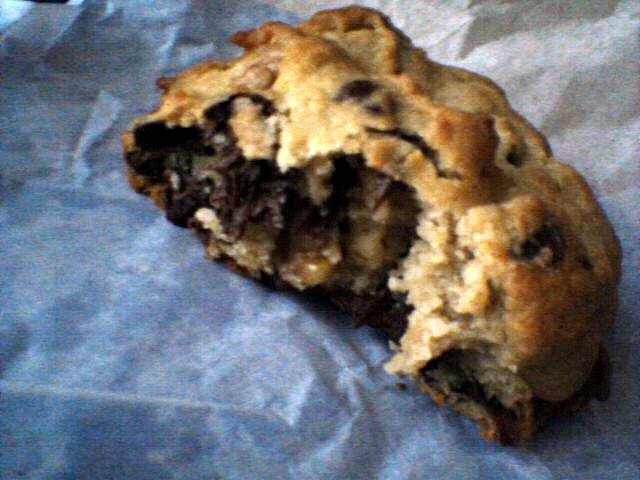 The cookie is very soft and chewy, though not at all unbaked. It's just barely set, while the outside is golden, with a slight crunch. The walnuts add a great flavor with the chocolate, and this cookie is packed full of both. Many bloggers have recreated the Levain cookie, so if you want to try your hand at making some yourself, try this recipe by Confessions of a Foodie Bride. Search the web for many more. There are a few other locations, too. Visit their website for more information. You posted editorial Levain Bakery in New York City which gives users bunch of information concerning meticulous subject recognition for this allocate.